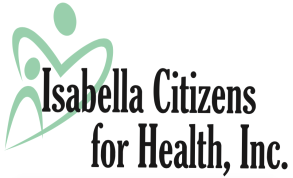 Giving - Isabella Citizens for Health, Inc.
Isabella Citizens for Health, Inc. is a not-for-profit corporation and designated as a Federally Qualified Health Center since May 2015. As such, ICH can participate in grant applications to receive funds that may supplement and/or fund additional services. The health center offers comprehensive primary medical care with access to many services not readily available to all people. ICH is currently staffed with eight full-time primary medical care providers. Our patient volume continues to grow and so does the need to recruit additional providers to work at the health center. Consider making a donation to help ICH continue to provide a medical home for all people regardless of insurance status. Your donations to our non-profit 501(c)3 corporation are tax exempt to the extent of the law.